We choose to split the different actions we are going to undertake in seven main work packages. The first one (WP1) is devoted to the preparation of the clinical study and will involve the definition of the protocol, the application to the Ethics Committees and the creation of the eCFR. WP2 is the core of the project and is made of two moments: the enrolment, lasting 9 months, and the 3 year follow-up. WP3 is devoted to the data analysis and falls under the responsibility of the statistician and the health economist, supervised by the Coordinator. In WP4 the process of adapting the intervention will be implemented through a conference of the entire Consortium partially conducted in accordance with the Nominal Group Technique, with the aim to produce a consensus document on the recommended characteristics of the SCU-B. Scaling up the intervention will be the topic of WP5 and is broken down in different tasks. WP6 concerns dissemination, exploitation and communication, under the supervision of the patients associations and the Coordinator. 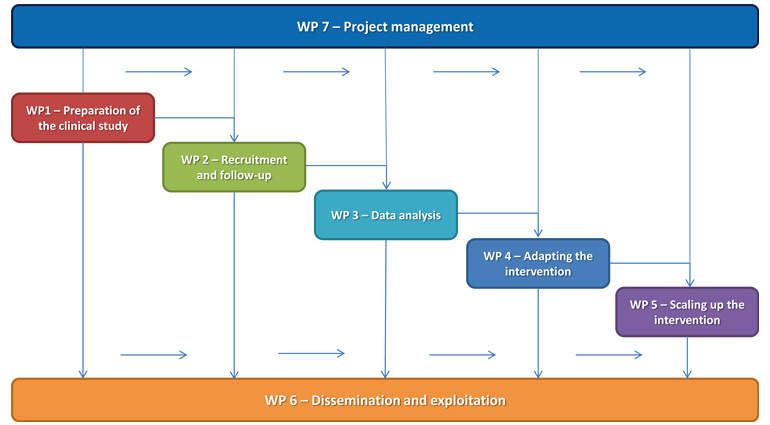 WP7 deals with project management and coordination.